Self-portrait, Greece, 1997 by Hans J. Knospe. I was born in Germany in 1940, in Freren, Emsland, near the Dutch border. Except for German literature and poetry (Creative Writing) and an experience with a wonderful art teacher, I didn't like school and left after nine years to become an apprentice in electrical technique. During this time I bought my first camera and developed my first darkroom for black and white photography. I preferred small good cameras and only took colour slides using these later with my poetry. So step-by-step my work came to be "photopoetry", as I have called it for the last 25 years. 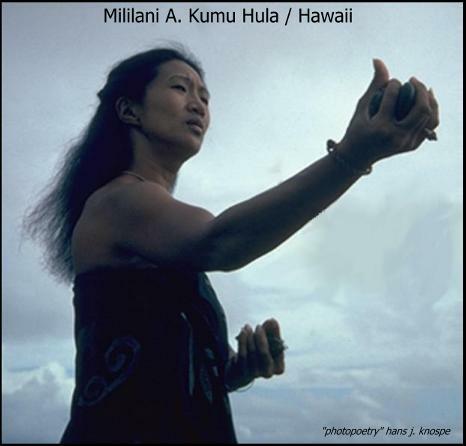 It is an attempt to see, feel and hear poetry -- an interplay of pictures, music and words. The music was background from cassette tapes etc. or (even better) from life together with friends. Over the years I have given many programmes, presentations, exhibitions, lectures, workshops in schools, colleges and universities with students of all ages, but also in kindergartens, youth centres, rest homes, art centres, libraries, etc. I worked as a serviceman, salesman, district-manager, for 12 years, while gradually questioning my life and developing my interest in psychology, education and art. I did courses and evening classes in these fields and became an educator in a boarding school for 'difficult' boys. I had a crisis for some years. In 1973 my marriage broke up and I left the (Catholic) church and gave up my job. 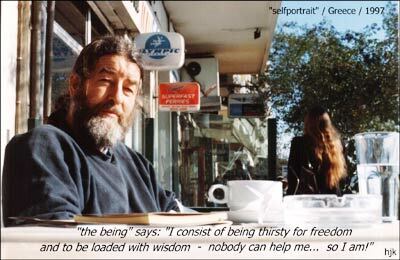 In 1978 I left Europe for about five years trying to "survive" as a freelance artist, making money through my art cards, small editions of books with haiku-poetry, and giving talks and teaching German. 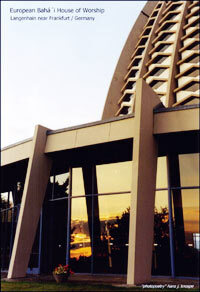 European Bahá´í House of Worship, photograph by Hans J. Knospe. 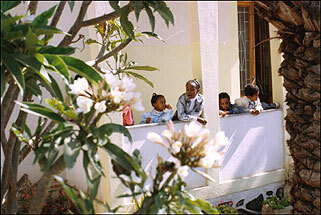 At the Baha´i Centre of Asmara, Eritrea, 1995. For about 10 years I felt close to the teachings of Krishnamurti, who helped me to understand my search for freedom and to question all kinds of conditioning until a totally new understanding of life and spirituality took place in me. In Mexico I was touched by the spirit of the Bahá'í Faith and I declared in 1983, in Hawaii, returning to Europe and Germany that same year. Later I was married for the next ten years to an Eritrean. 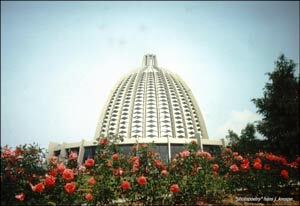 I met her family during a visit to Haifa at the Bahá'í World Centre and I visited them in the following year. We got married in Addis Abeba. Back in Germany I worked in a hospital as well as giving workshops, lectures and having exhibitions of my "photopoetry". But my wife was very homesick and so after one year we decided to move with our little son to Ethiopia but life was very difficult there. After consultation with family and friends we pioneered to Greece for one year with the help of friends. I am now married again (my wife is a teacher) and we live here on Sylt, a north Frisian island next to the Danish border. In the winter I work as a caretaker of the adult evening school (Volkshochschule) where I also have permanent exhibitions of my Photopoetry and give lectures and other creative workshops. 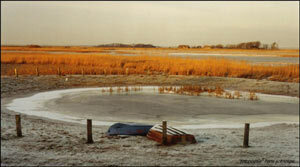 I am also member of an artist group here and have a permanent place at the so-called: Creative Barn (Kreativscheune). I am also registered with the Sylter Art Society (Sylter Kunstfreunde e.V.) which organises regular exhibitions at different locations here on the island. Last year I had a solo exhibition at the famous Dorint Hotel here on the island with 92 pieces of my work, including impressions of my 3 visits to Israel and the Bahá'í World Centre. 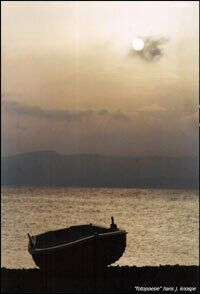 Encounter on the Greek Mainland, 1997. I am always working and preparing new ideas on the subject of art and education, which is my main interest. As a poet I love to use haiku, often in combination with my large collection of images or with new ones made for the poem itself - however, I don't feel like a photographer who writes poetry, but as a poet who takes pictures. As a Bahá'í I like to express my inner beliefs and spiritual understanding in my artwork, but without calling it Bahá'í art. My pictures of the European House of Worship near Frankfurt in Langenhain won the first prize of the NSA contest and I am happy that my artwork is understood by the editors of the Bahá'í "World Order" magazine in the U.S.A.
As an artist I need the challenge, struggle and duty of everyday life: facing the reality of the world around me and the responsibility of being honest with my inner self and working for a deeper understanding, while always growing in harmony in my personal relations with my wife, my five children and friends - both old and new. 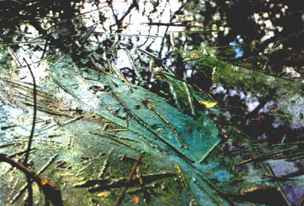 My goal, I would say, is to keep in my mind the views of Mark Tobey, Roger White and Tahirih: to encourage the individual to find his or her very own way in the investigation of truth, beauty and freedom in art and faith with an awareness of personal conditionings (Krishnamurti), shortcomings and progress. It's all relative anyhow - but my TAO, my way and my offer I call: "Photopoetry ". und tanzen in der aufsteigenden wärme. and dance in the rising warmth. 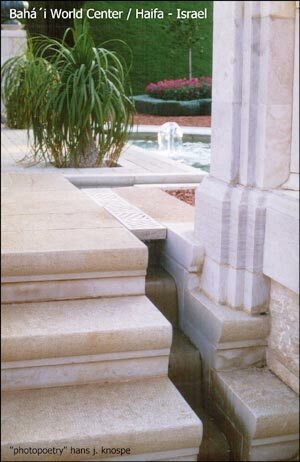 Detail of the New Terraces of the Shrine of the Báb / Haifa 1997. 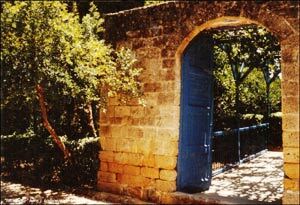 Entrance to "The Garden of Ridván", near Akká, Israel, 1987. 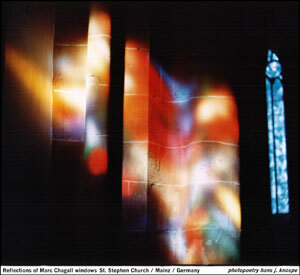 Reflection of the Marc Chagall windows, St Stephan's Church, Mainz, Germany. The Bahá'í German House of Worship, Germany. From: "sand dollars and pelicans"
so merk` - dass ich den schatten will! take note - i´ll take the shade as well. I wrote the poem prayer to the sun, in Montagnola in Tessin/switzerland, where the poet Hermann Hesse lived and died, and just after I'd read the "life-prayer" of Lou Andreas Salomé, an acquaintance of Nietzsche, Rilke, and Freud. ich gehe den strand entlang. i go along the beach. Sebenter Weg 23, D - 23738, Damlos, Germany.